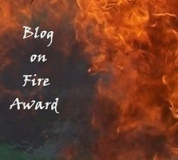 Today I’m sharing the love with the Blog On Fire Award. Many thanks go out to Anouchka from Life of Bun who nominated me for this award. If you haven’t seen her blog, you should definitely check it out. She is so talented and her blog is one that I read daily. I hate being told I can’t do something and will find a way to do it just to prove I can. I used to be a volunteer firefighter and first responder (loved every minute of it) – as requested I have added two photos below. I think I am a little bit of a feminist. The second you compare girls to guys I get all wound up. This goes hand in hand with #4. Thank you to Life of Bun for the nomination and a big “Thank You” to all of you that have stopped by. Feel free to link your blog or a blog you feel is on fire, below. P.S. – here are two photo’s of my fire fighting days. That is me on the right. I love sharing little projects I’ve attempted, bits of inspiration, things I find funny (yes I am that person that must get everyone in the room to look at something when I find it tickles my funny bone), and of course my stream of consciousness. The fact that you wonderful people read my blog, is something that I never take for granted and greatly appreciate. So when I get nominated for blogger awards, you can imagine my surprise and gratitude. First and formost, thank you Ingrid (from now at home mom) for nominating me for these awards. I love your blog and am honored that you nominated me for these awards. Copy the Beautiful Blogger Award logo and place it in your post. Thank the person who nominated you and link back to their blog. Tell 7 things about yourself. 4. Nominate 7 other bloggers for their own Beautiful Blogger Award, and comment on their blogs to let them know. Include the award Logo(s) in a post or in your blog. Answer 10 questions about your self. Nominate 10 to 12 other fabulous bloggers. Link your nominees to the post and comment on their blog, letting them know they are nominated. Share the love and link the person who nominated you. My greatest accomplishment is having my little boy – JBear. I cherish my family above all else – I am nothing without them. I am a true Gemini – I will start 100 projects at the same time (drives my hubby nuts). I am a country girl through and through (something about that fresh air, there is nothing like it). I am never content to stay still – I am always trying to improve myself. I am still trying to decide what I want to be when I grow up. And now to pass this honor on and nominate bloggers that inspire me. This is the hardest part because I can’t nominate everyone and all of you deserve such awards. But rules are rules so here we go…. Yes she actually said that. I can see your collective eye rolls from here! LOL!! The rules above are not set in stone. By nominating the blogs I thought deserved it, I do out of respect. It’s because I love how they always interact with other bloggers. Reading and commenting. They in my humble opinion represent the bloggers who support other bloggers in the best way! It is no way because I want to spam my blog, or get new readers. I really only want to honor other bloggers! Please don’t feel you are any way obligated in following the rules or doing anything other than accepting. To my nominees, thank you for doing what you do and inspiring those around you. I hope all of you check out these sites – they are fabulous reads and all very unique in their own way. 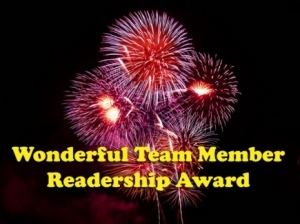 A Great reader is…all of you who read our blogs. Readers are what makes blogging fun!